Charyn canyon (entry gate to the “Valley of Castle”) is located 195km to the East from Almaty, it takes up to 3.5 hours to drive there. The Ash Tree Grove located a bit further to the east (230km from Almaty), in the lower reaches of Charyn River. By A351 road, and after Kokpek by A352 to the east from Almaty (230km). 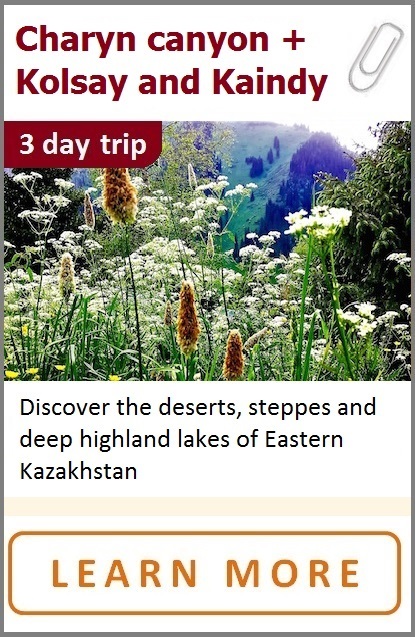 There is a bus connection up to Chilik town, but the best way it to take a Tourist bus directly from Almaty, or a taxi. It is a desert: the best seasons to visit are March-May and September - October. In Spring and Autumn the normal day temperatures are +23..25C, night +5..+15. In Summer period it can be really hot (uncomfortable): up to +40C during a day, +10..+20 in the night. Winter hiking is also available, but it can be cold (-10..-25C). The canyon’s most beautiful site, the Valley of Castles with its fantastic sand towers and walls of 150-300m in height. Relict Ash Tree Grove – the last place where Sogd Ash grows. 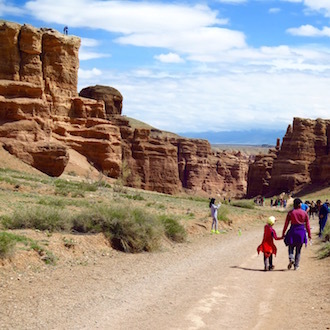 Charyn National Park is located in the Almaty region, 195 km to the east of Almaty. 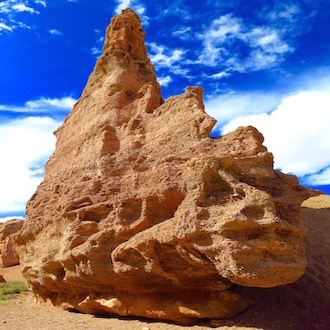 It includes the area of the Charyn canyon and the Ancient Ash Grove. The whole area of the canyon makes it second biggest in the world after the Grand Canyon of Colorado (US). It is a beautiful natural monument made of weathered sedimentary rocks whose age is about twelve million years. 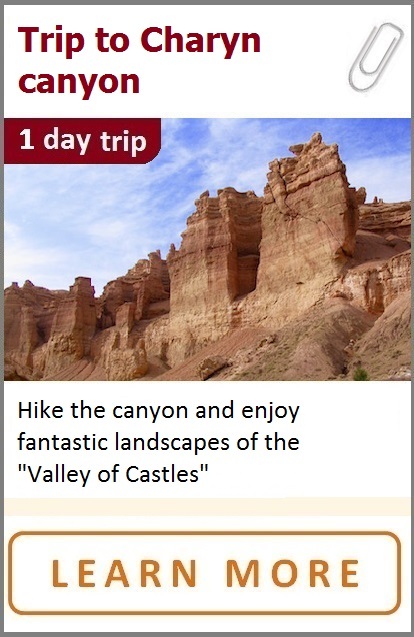 The canyon’s most beautiful site, the Valley of Castles, reveals to the eye intriguing red sandstone rocks created by two eternal forces of nature – time and the wind. The height of the vertical walls in this part is between 150 and 300 meters, and their shapes are so different! Some formations look like fossilized dinosaurs, the others seem to be the heads of giant wizards. The fantastic towers, sky bridges and other indescribable figures of different colors make you feel walking through the real Fairyland! 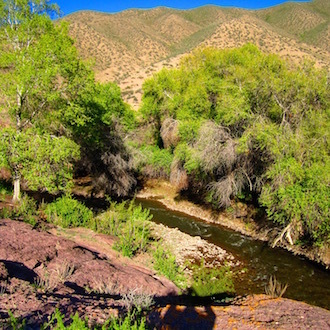 The canyon is called after a river “Charyn” (or Sharyn in Kazakh), it is rich in trout. More than 1,500 species of plants, including 17 species in the Red Book of the Republic of Kazakhstan live in the valley of Charyn river. It is a home to such rare animals like mountains goats and Golden eagles. 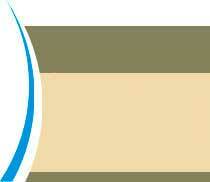 24 species of mammals, 48 species of birds, three species of amphibians, and 14 species of reptiles can be found here. 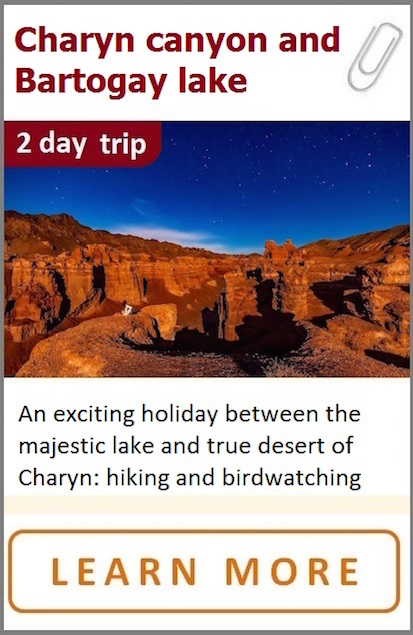 Another attraction of Charyn National Park is a famous Ash Tree Grove located in the lower reaches of Charyn river, 230km from Almaty. The grove seems to be the last place (along with Temirlik liver) where the relict Sughd /Sogda Ash tree grows (Fraxinus sogdiana). This rare plant needs much of fresh water to survive, so it grows in the small oasis on the riverbanks.